In today’s SEO-driven world, most companies have realized that content – whether it is in the form of words, infographics, photos or video – is necessary to stand out. Most have also realized the generating a constant stream of content for Google to consume is time- and labor intensive. Yes – it’s tough maintaining a steady stream of fresh content for your website, a newsletter, your blog, your various social media channels, and your marketing materials. This challenge has given rise to B2B content writers and digital content agencies that create content for you – allowing marketing departments to focus on executing their overall marketing plan. 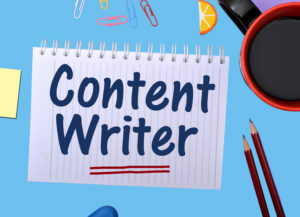 Not all writers or content marketers are the same, of course, and there are a number of traits you need to evaluate, beyond the cost. Below are some of the common ‘who, what, when & how’ questions you should ask when choosing a writer or agency to write your content marketing projects or manage your corporate blogging & social media program. Know that writers or agencies have different ways of working with B2B clients. I’ll speak to my approach when discussing the following questions. Keep in mind that the approach is less important than the result, but you will need to feel comfortable with the writer’s workflow process. Here are a few things you need to know and questions you should ask the content writer or agency you are considering before you hire them. Does the agency produce the content in-house, or outsource its creation? Some agencies don’t write content in-house – and that isn’t necessarily a bad thing. Content writers like me are often brought in by marketing agencies to write content for clients in particular industries (in LM Group’s case: the life sciences & B2B manufacturing sectors). This allows agencies to offer their services to a wider range of industries. Be aware that there are cases in which firms might be writing (or buying) less expensive – and often much more general – content. For example: if you sell parts to 3D printing equipment manufacturers, an article on your site highlighting key differences between laser & inkjet printers wouldn’t be helpful to your business – nor it would help build thought leadership in your particular space. So be sure the content you’re going to be paying for fits your marketing goals. How familiar with your industry is the writer who will create your company’s content? The most valuable content you can share is the content that builds brand awareness, demonstrates thought leadership in your industry, and converts prospects into customers (or your current customers into repeat purchasers and enthusiastic brand loyalists). Your content needs to be from you, in your company’s voice, and it must be targeted towards solving the problems or challenges your audience faces. That content needs to be written by someone who understands your industry and your customers. It also needs to be written at the educational level of your customers. Many content writers specialize. It doesn’t preclude a writer from writing for other fields but specialization does allow us to get up to speed on your project much faster. It’s a writer’s job to become a mini-expert who can represent you & your brand in words. I’ve always felt that a key differentiator of ours is the degree to which we educate ourselves about a client’s industry. For us, it simply makes it easier for us to communicate your message and it’s an integral part of what we do. We need to make sure – whether we’re conveying the relative benefits of different chromatography techniques or discussing competing plastic extrusion technologies vying for share in a mature market – that we can speak intelligently about your business, your industry and to customers. When will I see content? How long will it take? Questions about timelines are common: how soon can you finish the website copy, when can we send our first newsletter, how long until our social media program goes live? It is important for you and your writer to set clear expectations. Most writers and agencies have an efficient workflow developed over time that will help guide you through the content creation process. For instance, my process involves research – and lots of it. Before I write a single page of a website or a newsletter article or launch a social media program, I need to understand your company, your products or services, your customers and what motivates them, your competition and their solutions, and much more. To accomplish this, I hold a Discovery Session with you where we talk about all of these things. This allows me to “become” you and get into your customer’s head. Launching any project involves some lead time – progressing from discovery, research, strategy through content creation and approval process. Typically, once a Discovery Session has been completed, I provide clients with a timeline with deadlines for both myself and the client. What’s involved? How much will I have to do with blogging or social media? – Guidance on content topics. This helps us better understand what you see as the key talking points, or competitive advantages you want to convey to your prospects or customers. In some cases, you may already have a white paper, article or landing page that will provide a clear starting point for content development. And if not, we can help you build out a broader content marketing model for a specific event or topic. – Approval for all content prior to publication is something we absolutely insist on in order to protect your brand. Mistakes online can have reputation- & budget-impacting consequences. You will be the driver in deciding how hands-on you want to be with your website, newsletter, blog or social media content project. We have found that more participation tends to lead to better results but you need to clearly state how hands-on you expect to be right upfront – before you hire someone. B2B ghostwriting & blogging will help you create the content your marketing department needs to vie for audience mindshare online while keeping your critical organic SEO active. Choosing the right provider can seem like a daunting task. Remember these five key things and you’ll find the right writer with whom to partner. Understand what your role will be, and what the process or workflow will be to maximize success and minimize hassle. Understand that the more you share with the writer, the greater the ROI. If you’re in need of assistance with your content, give us a call. We’re happy to answer questions and guide you to the right solution!